Hazrat Khwaja Qutbuddin Bakhtiyar Kaki r.a. was born in 569 A.H. [1173 C.E.] in a town called “Aush” or Awash in Mawar-un-Nahar (Transoxania). Khwaja Qutbuddin’s r.a. original name was “Bakhtiyar” but his title was “Qutbuddin”. The name “Kaki” to his name was attributed to him by virtue of a miracle that emanated from him at a later stage of his life in Delhi. He also belonged to the direct lineage of the Holy Prophet Muhammad s.a.w.s., descending from Hazrat Imam Hussain r.a.. Hazrat Khwaja Bakhtiyar Khaki r.a. was one and half years old when his father passed away. His mother arranged for him very good education and training. When Hazrat Khwaja Mu’inuddin Chishti r.a. went to Isfahan, 40 days before his demise, he took oath of allegiance at his hands and received the Khilafat andKhirqah (Sufi cloak) from him. 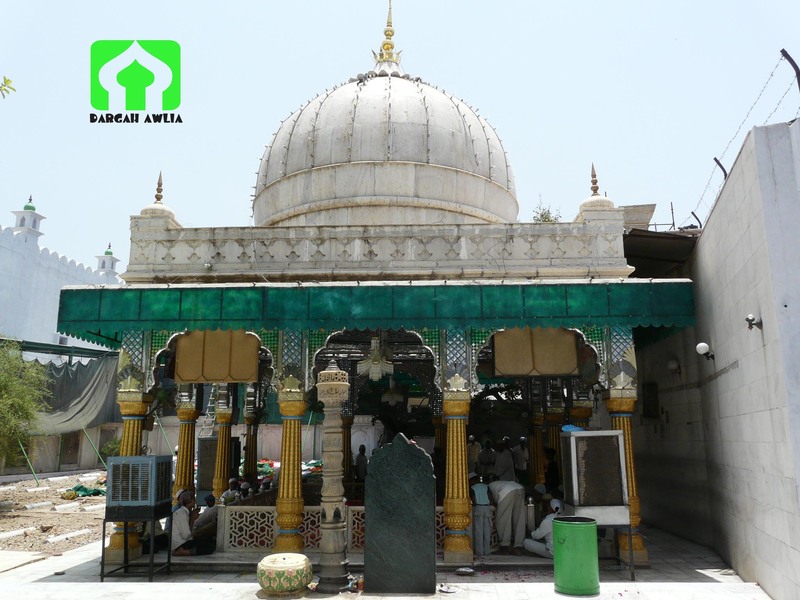 Thus, he was the first spiritual successor of Hazrat Khwaja Gharib Nawaz, Khwaja Mu’inuddin Chishti r.a. Thereafter, his spiritual master asked him to go to India and stay there. When Khwaja Qutbuddin r.a. intended to kiss the feet of his Pir-o-Murshid and seek his permission to depart, Hazrat Khwaja Sahib understood it and asked him to be nearer, and when Khwaja Bakhtiyar r.a. stepped up and fell at his Pir’s feet, Khwaja Mu’inuddin r.a. raised him up and embraced him affectionately. AFateha was then recited and Khwaja Mu’inuddin r.a. advised his Murid: “Never turn your face from the right path of Sufism and Truth. Prove yourself to be a brave man in this Divine Mission.” When he again fell at the feet of Khwaja Mu’inuddin r.a. overwhelmed with love and grief at this tragic hour of parting, he was again raised and embraced affectionately by his Pir-o-Murshid. Following this order, he went to Delhi and stayed there. It was the period of Sultan Shamsuddin Iltutmish. Hardly twenty days had passed when news was brought by a messenger that Hazrat Khwaja Gharib Nawaaz r.a. disappeared into the eternal Divine bliss of the Almighty Allah. Hazrat Khwaja Bakhtiyar Kaki r.a. used to offer 95 Rakats of Salah [sections of prayer] during the 24 hours of day and night, along with 3000 Durud Sharifs [a part of prayer] every night upon the soul of the Holy Prophet s.a.w.s. During the first 3 nights of his first marriage, he could not maintain the Durud Sharif. The Holy Prophet s.a.w.s. sent a visionary message to a pious person named Rais Ahmed, asking Hazrat Bakhtiyar Kaki r.a. the reasons for his not reciting the Durud Sharif. Hazrat Bakhtiyar Kaki r.a. divorced his wife forthwith as a mark of repentance and thereafter broke off all worldly ties and devoted his full time to the devotion of Almighty Allah and the Holy Prophet s.a.w.s. It is narrated that in the early stages of his life, Hazrat Khwaja Qutbuddin r.a. would take a nap, but in the last part of his life he kept awake all the time. He had also committed the Quran to memory and used to recite and finish it twice daily. Whenever anything came to his Khanqah, he quickly distributed these to the poor and needy. If there were nothing, he would request his attendants and mureeds to distribute plain water as a humble token of his hospitality. Thereafter, he came home and after the meal was over, he asked the people to call the owner of the land to him. When the owner came to him, he purchased that piece of land from him. Later, Hazrat Bakhtiyar r.a. was buried in the same soil. Hazrat Khwaja Bakhtiyar Kaki r.a. was so much absorbed in and inspired with this verse that from that day on he kept on reciting it in a state of unconsciousness and gave his life in the same state. He remained in this state of Wajd for 3 consecutive days and expired on the 4th day. He passed away on the 14th of Rabi-ul-Awwal 633 A.H. On account of his extraordinary death, Hazrat Khwaja Qutbuddin Bakhtiyar Kak ir.a. is known as “Shahid-e-Mohabbat” or Martyr of Allah’s Love. The Mazaar Sharif [noble tomb] of Hazrat Khwaja Qutbuddin Bakhityar Kaki r.a. lies near Qutb Minar at old Delhi, India. He also enjoys the following titles in the Sufi world: Qutub-ul-Aqtaab, Malik-ul-Mashaa’ikh, Rais-us-Saalikin, Siraj-ul-Auliya, etc.